We love wineries that showcase a country’s indigenous varieties. In Cyprus, about 80% of the vineyards are planted with ungrafted, native grape vines. Nearly every winery makes a wine out of the indigenous white grape Xynisteri. Increasingly, more producers are making red wine from the native grape Maratheftiko. However, most producers also have Chardonnay, Sauvignon Blanc, Cabernet Sauvignon, Merlot, or Shiraz in their portfolio. Vouni Panayia is the only commercial winery that produces dry wines exclusively from indigenous varieties. The family winery was founded in 1987 by Andreas Kyriakides and it was one of the first private wineries in Cyprus. The winery is located in the Panayia village in the Paphos District. The village is known as the hometown of Archbishop Makarios III, the first President of Cypriot democracy. The Vouni Panayia winery boasts a restaurant and a spectacular view of Mt. Panayia, which the winery is named after (Vouni means mountain). It is a large and modern-looking complex situated at 850 meters in elevation, but do not be mistaken: this is not an industrial winery, it is a family-owned business. Andreas’ home is right next to the winery. Now, the next generation is ready to instill a new sense of vigor in the winery, bringing along with them not just passion but also academic knowledge to be combined with Andreas’s grasp of tradition and experience. Andreas’ sons Yiannis and Petros Kyriakides graduated from a viticulture and oenology school in Florence, Italy. The youngest son Petros is currently enrolled in an agrotourism and hospitality faculty in Greece. We meet with Yiannis Kyriakides, the eldest brother for our visit. 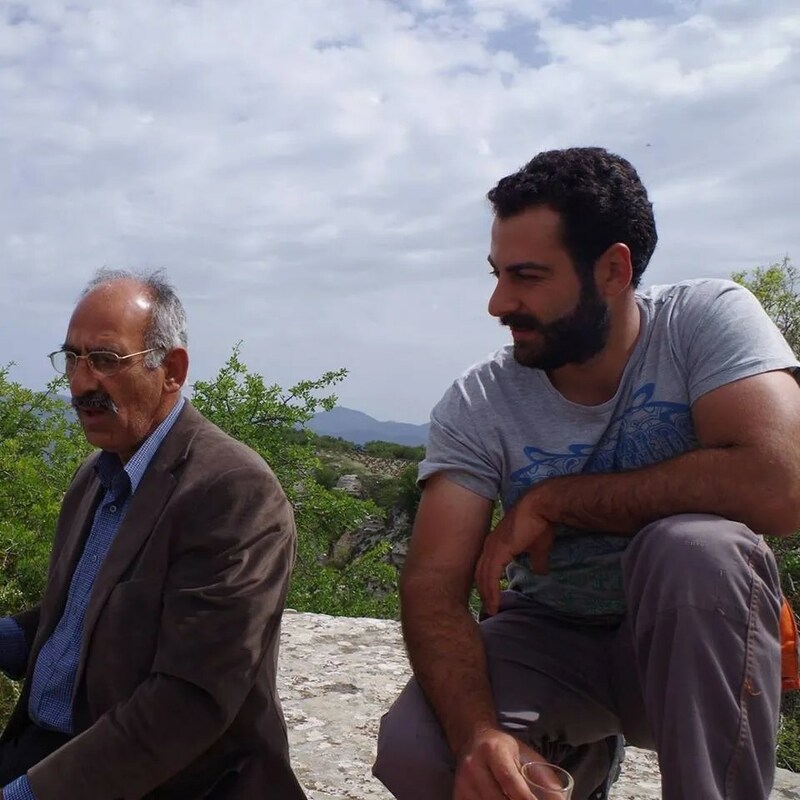 Yiannis is on the right and Andreas, his father and the founder of Vouni Panayia, is on the left. At the age of 29, Yiannis is markedly level-headed and clear about the direction of his family business. Yiannis shows us around the grounds, winery, and cellar. The facilities are clean, minimal, and functional in design. The restaurant is open to reservations only and uses local, seasonal ingredients to prepare traditional Cypriot dishes for the guests. We do not have a reservation for dining this time and hope to experience the food here on a future visit to Cyprus. The wines of Vouni Panayia are made of grapes harvested from 25 hectares of estate-owned vineyards and about 20 hectares of contracted vineyards. The estate’s vineyards are located in the Troodos mountains. The vineyards enjoy a Mediterranean climate, with mild winters and summers cooled by the mountains. At Troodos, soil composition range from volcanic to limestone and clay. Vouni Panayia’s vineyards possess mostly clay to gypsum-clay structural composition, which helps to retain water in the dry condition of Cyprus. The vineyards are at 1,150 meters in elevation. 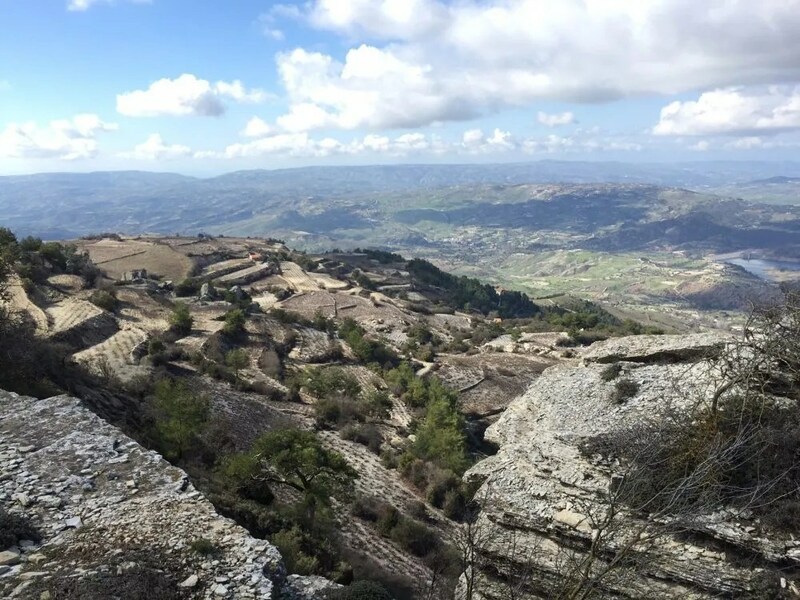 “The top of the mountain is a plateau covered in vines,” says Yiannis. We would later discover that it is an all-dirt track to the plateau and the mountaintop is indeed blanketed in vines—enigmatic-looking, old bush vines. The vineyards on top of the mountain are truly a sight to behold (the article’s feature photo is a shot from the top of the mountain). The indigenous varieties grown by Vouni Panayia include Xynisteri (Xinisteri), Spourtiko, Promara, Mavro, Maratheftiko, and Yiannoudi. Like all the vines in Cyprus, these vines are grown on its original roots as American rootstocks are not required since Cyprus was never affected by phylloxera. Currently, the Vouni Panayia winery produces eight styles of wine—three dry whites, one medium-dry white, one rosé, and three dry reds. The total annual production is around 300,000 bottles. The winery is in the process of getting certified as an organic producer. Yiannis leads us through a tasting of the entire portfolio and mini verticals of the red wine Barba Yiannis (Maratheftiko) and white wine Promara. The 2014 Promara is the only Cypriot wine to have won a Gold medal at the 2016 Decanter Awards. All the examples range from very good to outstanding. The Vouni Panayia’s Maratheftiko is the softest Maratheftiko we’ve tasted among all the Cypriot producers. The Promara is so unique that we have to taste it over and over again before finalizing our notes. But what really captures our attention is the Yiannoudi. Besides wines, the winery also produces other traditional grape products such as Zivania (Cypriot spirit), epsima (concentrated grape juice), soutzioukos (candle-shaped candy made with nuts and grape juice), palouzes (grape jelly), and jams. Vouni Panayia is the only producer of Promara wine. This wine spent three months on the lees in French oak. Flavors of yogurt, lemon, melon, soybean, wet stone, and white flower. Nice weight and oiliness on the palate. This wine will be a lot better after at least another year in the bottle. A unique and bright wine. At the recent 17th Thessaloniki International Wine Competition, the 2014 Promara received a gold medal and 2015 Promara a silver. We also tasted the 2013 vintage and found the 2015 to have more interesting characteristics. Yiannis is a believer in the potential of Promara. “It seems that this variety is a gem,” he says. Made from 100% Maratheftiko grapes from vines with an average age of 70 years old. Aged for 12 months in barrel and 12 months in bottle. Notes of mushroom, forest floor, black plum, blackberry, coffee rub, geranium, and graphite. Medium-plus body with a juicy mouthfeel. We also tasted the 2014 vintage. The tannins in 2013 are much more integrated in comparison. The 2014 has more pyrazine, white pepper and spice notes to it. Made from 100% Yiannoudi. Aged 12 months in French oak and 12 months in the bottle. There are currently three other producers making varietal wine from Yiannoudi grapes—KEO, Tsiakkas, and Vasilikon. 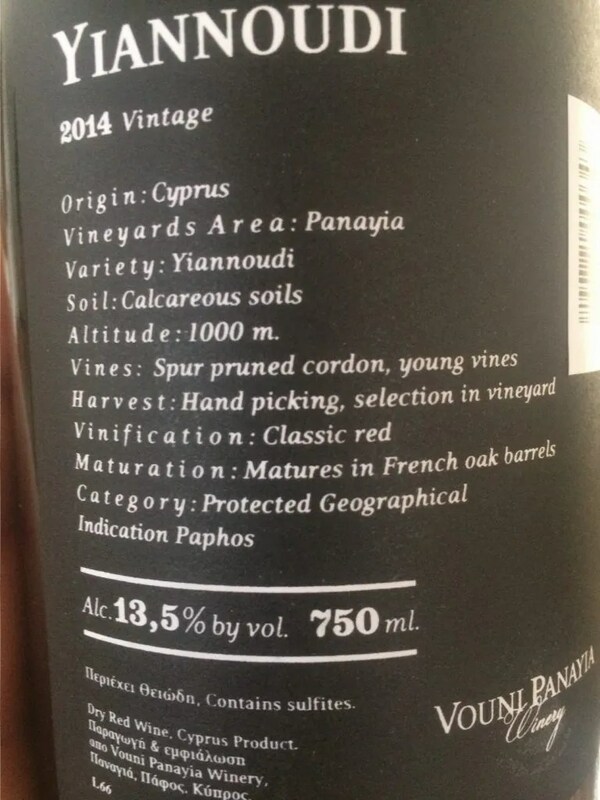 The Yiannoudi vines of Vouni Panayia are merely 6 years old. 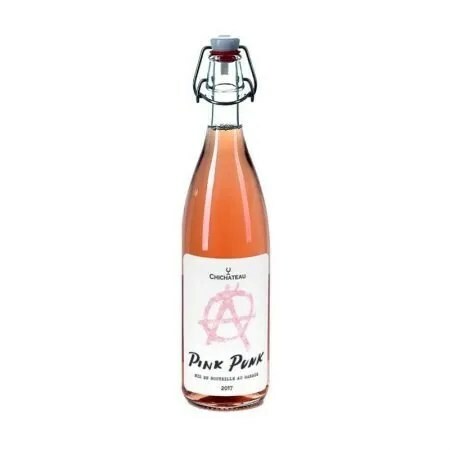 This wine expresses notes of cream soda, licorice, blackberry, blueberry, and graphite. Medium weight on the palate with ripe tannins that give a little tug from the front palate till the end. A spike of black fruit, pencil shaving, and graphite notes that finishes off the end palate. To Matt, this reminds him of Syrah; and to Charine, Zinfandel. A charismatic wine that shows off the potential of Yiannoudi as a variety. We look forward to tasting future vintages of this wine as the vines gain more age. Vouni Panayia is one of the heavyweights in the Cypriot wine industry. 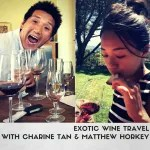 Their focus on native grapes has garnered much respect and attention in the country. All the examples we’ve tasted from this winery are well crafted and we are confident about presenting their wines to wine professionals (and we are planning to). Their wines are a must-try on a visit to Cyprus. “In my opinion, it is only through the indigenous varieties that the wine sector in Cyprus can move forward,” says Yiannis. And if that’s the case, the indigenous varieties and wine sector in Cyprus are both in good hands. Stay tuned to our website for more in-depth articles and videos on the Cypriot wine scene. Disclaimer: Our trip was partially sponsored by the Cyprus Tourism Organisation, The Annabelle Hotel (Paphos), and Saint Elena Hotel (Larnaca). A few wineries provided us tasting samples, but most of them simply gave us their time. The opinions expressed in this article are our own and we are under no obligation to give favorable reviews. Great post, guys. Vouni Panayia does a great job with the indigenous varieties, a wonderful representative for Cyprus wine. After reading this, I’m tempted to uncork my 2015 Promara although I said I’d let it sit for another year. Haha. Happy drinking! Thanks a lot Mateo!! I would say save it but since you are in the country you can always get more! We opened a 2013 Promara a few weeks ago and still have a 2014 Yiannoudi left. Which Cypriot variety are you the highest on? Overall, I think it’d have to be Xynisteri thanks to its role in Commandaria. Reds, I have enjoyed Yiannoudi a lot more than Maratheftiko. What did you guys think of Morokanella & Spourtiko? For Spourtiko, it’s unfair for us to judge because we haven’t tasted enough. For Morokanella, both Vasilikon and Aes Ambelis make nice examples. Nothing complicated; yet the high-tone aroma may take the variety far.